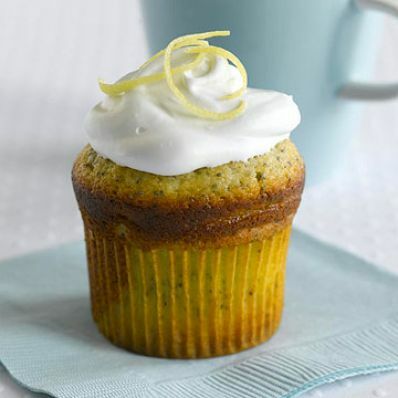 These tangy lemon-flavored jumbo cupcakes are baked in a popover pan. You can easily substitute a jumbo muffin tin if you prefer. 1 of 5 Heat oven to 350 degrees . Coat a popover pan (see Note) with nonstick cooking spray. Line each indentation with a paper liner, or line 6 indentations of a jumbo muffin tin with paper liners. 2 of 5 In large bowl, whisk flour, sugar, baking powder and salt. 3 of 5 In small bowl, whisk milk, lemon zest, juice, egg, egg yolk and oil. Make a well in the flour mixture; add milk mixture. Stir until all flour mixture is moistened. Stir in poppyseeds. 4 of 5 Transfer batter to prepared pan, a heaping 1/3 cup per indentation. Bake cakes at 350 degrees for 25 minutes. 5 of 5 Remove cakes immediately from pan; cool completely on a wire rack. 1 of 2 In small saucepan (not nonstick), mix sugar, egg white, lemon juice, 2 tablespoons water, corn syrup, cream of tartar and salt. Heat over medium-low to medium heat, beating continuously with an electric mixer until medium-stiff white peaks are formed and an instant-read thermometer registers 150 degrees , about 7 minutes. Remove from heat. Beat an additional 1 minute. 2 of 2 Spread cooled cupcakes generously with icing, about 3 tablespoons per cupcake (there will be icing left over). Slip cakes into clean cupcake liners, if desired, and tie with ribbon or string. Per Serving: 296 mg sodium, 7 g pro., 456 kcal cal., 1 g fiber, 13 g Fat, total, 80 g carb., 2 g sat. fat, 74 mg chol.